We had our walking shoes on today exploring Mykonos. Our hotel was just out of the old town centre. For us this afforded some tranquility at night. 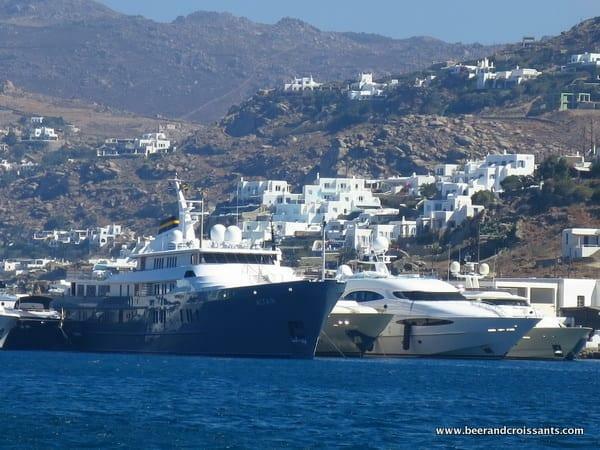 Mykonos is not known as the party town for nothing, so staying in the heart of the town would provide for a totally different experience. The buildings are all very close together so if noise is a problem for you, I’d suggest staying in a location similar to ours. It’s still easily accessible by foot, although again, if fitness is an issue there is a bus that you can catch into town. It took us about 10 minutes to walk into town and whilst relatively straightforward, it offers more than it’s own level of excitement as you navigate down the hill, walking on the narrowest of road shoulders, trying to avoid getting hit by the never-ending stream of manic tourists on mopeds. As soon as we entered the labyrinth of streets that are the old town, I was overwhelmed by the picture perfect, postcard images that were laid out in front of me. The white buildings are still what brings this area together, but there is also another unique architectural feature. Here, the colours are more vivid and the style of housing is different. Through the narrow streets, coloured in a black and white design, these houses generally sit one story above where we walk. They are accessed via a set of straight steps, running parallel to the road. At the top of the stops is a small balcony and the front door. 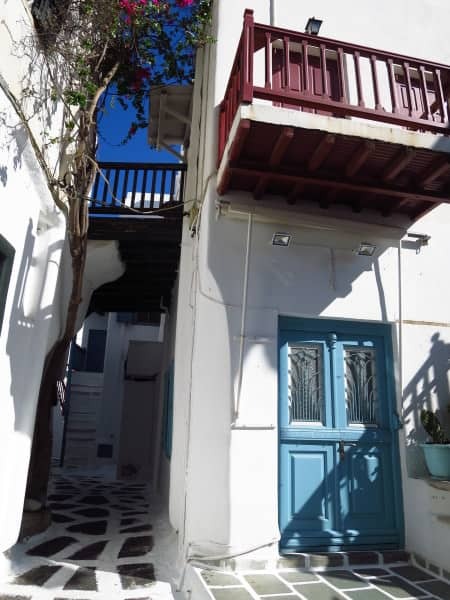 Here, the strict blue and white colours that are elsewhere throughout Mykonos take a diversion to a palette of vivid colours, lining these ancient streets. As you can see from the photos below, this is why these houses are amongst some of my favourite in the world. 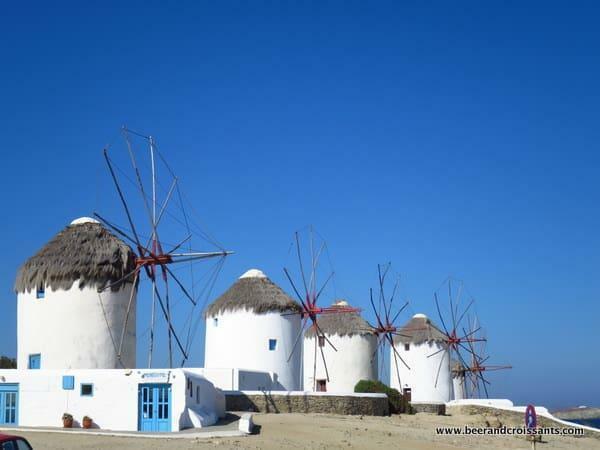 Equally as famous on Mykonos are the windmills, standing prominently on the edge of the ocean, and visible from every part of the old town. They were also visible from our hotel, making them a good point of reference. Dating back to around the 16th century, these former working windmills now have a dual role, representing a bygone era and industry on the island, but now firmly positioned as an iconic tourist attraction. Never keen on missing an opportunity, many of the windmills have artists nestled in the base. One of the hotels nearby to ours has also converted one into a guest room. Now that would be a cool place to stay the night! Continuing the intrigue on the island is the eclectic mish-mash of buildings in Little Venice. The colourful buildings overflow onto the ocean, in a display that could make one think they could topple in at any time. 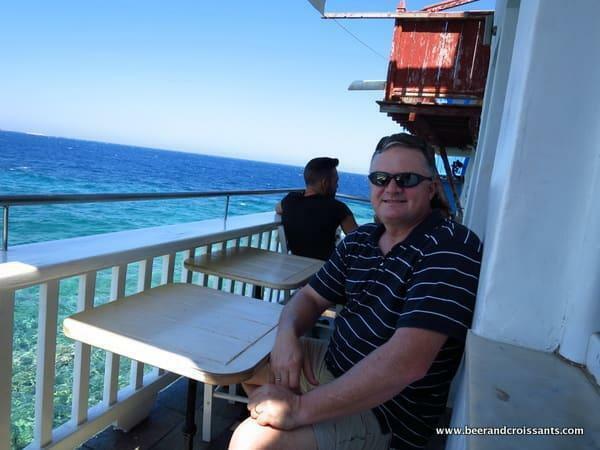 With their wooden balconies literally hanging over the water, they make for a fantastic location to enjoy a beer at any time of the day, or to watch the sunsets at night. Just don’t go out there is sitting on a narrow, timber balcony is not your thing. There were moments, even for me, that I considered the possibility of having an unplanned swim! If I didn’t though, I would have missed being able to watch a Greek elder hang out her washing on her little balcony right next to us in the bar. A reminder of how these communities are integrated, and how even in the most touristic of places, old habits and customs die hard. Squeezy balcony but what a location for a beer! Just to prove that Mykonos is not all about partying, a little further around from Little Venice is the most photographed church on all of Mykonos, ‘Panagia Paraportiani’. And that’s really saying something. The Greeks are highly religious and there are around 400 churches on this island alone. As we worked our way around the island, we stopped by the old port for lunch and to really just sit back and marvel at the BIG, FANCY boats that pull up. Many of their owners/passengers come into port, anchor and catch their tenders onto the mainland for a spot of lunch. Not a bad way to travel really! The cruise ships also anchor off here. It was a common sight to see at least two or three cruise ships at any one time. Depending on the time of year, and the health of the economy, you could see as many as seven or eight of the big ships docked off the coast. It’s quite a sight when you are not used to seeing them. There is plenty to do in the old town of Chora, so our afternoon was spent quietly ambling our way through the narrow streets, stopping often to admire a local artist’s wares, do a spot of shopping, or finding our way into yet another bar along the oceanfront.